"The devil walks... But the devil can make no headway if he has no help. We must invite him in..."
The Devil walks is the first Anne Fine I have read in years. I remember her as an author of funny children's books and was genuinely blown away by how different her latest offering is and how it was certainly not some I would have associated with her. 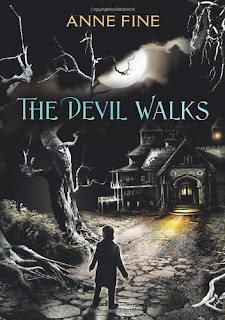 The devil walks is one of those books that both makes you think and leaves you a little bit unsettled. I liked that the story kept with me for a day or two after I finished it and kept playing on my mind. At the start of the books you meet Daniel. He is a young boy who has spent his entire life settled away from the rest of the world spending all of his days with his mother who is clearly unhinged. Events progress and Daniel finds himself alone in the world and starts to discover all the things he has never had the chance to experience before (like seeing cows in a field). The only link he has to his past is a dolls house which houses a collection of somewhat creepy dolls. Later Daniel is moved to live with his 'Uncle' in a house which is an exact replica of the doll house he has spent years playing with and his uncle bears a frightening resemblance to the doll in the collection which is the most disturbing. What I found most remarkable in this book was the main character Daniel and seeing how he deals with this whole new reality he has found himself thrust into in. The way he deals with the challenges tells you a lot about human resilience and adaptability. This book gets more creepy as you go on. Daniel's uncle gets more and more unsettling with his erratic behaviours and towards the end the way he acts is downright frightening. I shan't spoil the plot by giving too much away except to say this is a book you can't afford to miss if you like all that is Gothic and creepy. Great review - I don't think this is one that I would read now, but I can definitely see it's appeal. I haven't read anything by Anne Fine for years! This really does look creepy. I'm going to go and add it to my wish list now. Thanks for a great review Kirsty. I'm not sure that I've read a book by Anne Fine before, but I do love how creepy this one sounds! I loved the spooky offset of this book and look forward to checking out similar ones in the future!